A 12-year-old girl has organised a strike after saying she is being ignored by teachers proposing to turn her school into an academy. Georgia Abbott and about 50 other pupils will protest outside Crown Woods College, in Eltham, next week, claiming their concerns over the school becoming an academy were not taken seriously. The schoolgirl, who launched a playground petition for her campaign, said she was prepared to accept punishment for the strike if it meant being listened to. 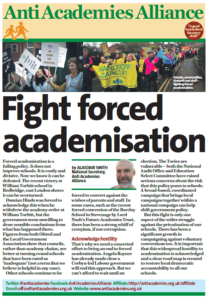 `Save Our Teachers…Save Our Teachers’… This was the chant going up at the Oasis Academy MediaCityUK last Tuesday as pupils learned that 12 teachers were being axed in cutbacks at one of Salford’s `flagship’ schools. 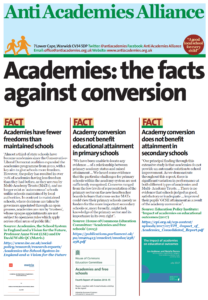 Head teachers and Governors are coming under considerable pressure to convert to Academy status. 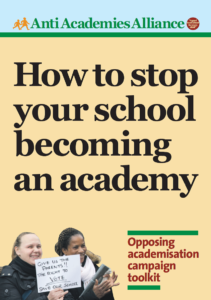 This Briefing looks at some of the main questions that need to be considered before a school decides to embark on the road to becoming an academy. The Department for Education has announced pilot areas for a new system to deal with excluded pupils. The system will see schools continuing to fund the education of pupils they permanently exclude and to have these pupils’ attainment included in their overall performance.